Val grew up in Lithuania, a small country in between Germany and Russia. He came from a secular Jewish family of free thinkers who did not believe in organised religion. During the inter-war years, Lithuania was on what Val describes as “a political fault line”. It was a tiny country of about three million people caught between two superpowers: Nazi Germany in the West and Communist Russia in the East. As a young man, Val wanted to become a pilot. Aviation was his passion and he loved building model aeroplanes. Instead, he enrolled to study architecture, but his education and plans for the future were interrupted by the coming conflict. In Summer 1940 the Communist Red Army marched into Lithuania along with the Russian Secret Police, the KGB. They turned every aspect of life upside down. Anyone who owned land or a business was classed as a Capitalist enemy of the people, for which the punishment was deportation to a Siberian slave labour camp. The Ginsburgs’ property was confiscated and they were put on a list to be deported. Fate intervened and the week before they were due to be taken, Hitler’s army began an assault on the Russian empire and swept through Lithuania. Val’s family faced a difficult choice. They could flee into Russia or stay put and try to survive under the Nazis. 14 members of Val’s immediate family gathered to make the choice. After a morning of debate they chose to stay, hoping that their chances of survival would be better under the Germans than the Communists. The Nazis immediately began to implement their racial laws against the Jewish population. They were deprived of every basic human right. Jewish people were not allowed to walk on the pavement, use public transport, have a telephone, or even own pets. They had limited access to food, and constant hunger sapped their morale. The most terrifying thing for Val was the constant arrests and executions. Within two months of the Nazi invasion, the 35,000-strong Jewish population of Kaunas had been reduced to 30,000. On 15 August 1941, the Jewish population was crammed into a ghetto in a small suburb of Kaunas, surrounded by barbed wire and armed sentries. They had no fuel and barely any food. Val was sent out as a forced labourer and kept his remaining family alive by scrounging potato peel which his mother cleaned and cooked. Val’s most upsetting memories are of the massacres: the ‘Big Action’, in which 10,000 people were taken away and shot, and the ‘Children’s Action’ in spring 1944 when all the ghetto children, along with anyone who was old, sick or disabled, were forcibly taken away and murdered. By 1944 only about 12,000 of Kaunas’s Jews remained alive. The German army was in retreat. The remaining Jews were ordered onto cattle wagons and taken into Germany to work as forced labourers building factories for the production of Messerschmitt jet fighters. 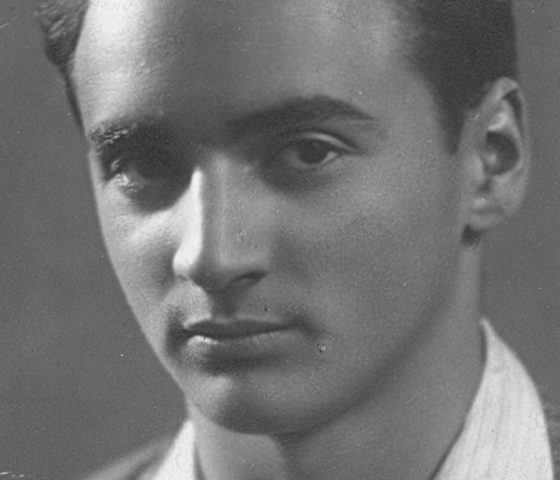 After a three-day journey, Val arrived in Dachau where he was forced to do back-breaking work on starvation rations. By the time he was liberated by the American armed forces on 1 May 1945, Val was ‘a walking skeleton’. Val’s liberation euphoria soon turned into a deep depression. Of the 14 family members who had gathered to decide whether to stay or go, he was the only one left alive. Out of the 35,000 Jewish citizens of Kaunas, only 2000 were left. Val spent six months in hospital, and while he was there he met his future wife Ibi. Val describes their meeting as ‘therapeutic’ and together they decided to embark for England and start a new life. They married, arrived in England in October 1948, and quickly became British citizens. They spent their working lives in the textile industry in West Yorkshire and brought up their two children. Val and Ibi remained a devoted couple for over 60 years. Sadly Val died in 2011. We all miss him greatly.